Playing board games is a popular pastime and a great way for people to reconnect with their friends, whether you’re at home or in the field! The Nile Scribes are avid board game players and we want to share some games relating to ancient Egypt with our readers. Our first game review is for Archaeology: the New Expedition, released in 2016, a game that takes the player back into the early days of Egyptology. This game is an updated version of the original Archaeology: The Card Game from 2007. Advertised for 2-5 players and for ages 10 and up, this game takes place in the 1920s when Tutankhamun’s tomb was discovered. While the game title is simply Archaeology, all the cards have an ancient Egyptian flavour, from a Howard Carter-esque figure hauling off unearthed treasures, to Tut’s funerary mask itself. 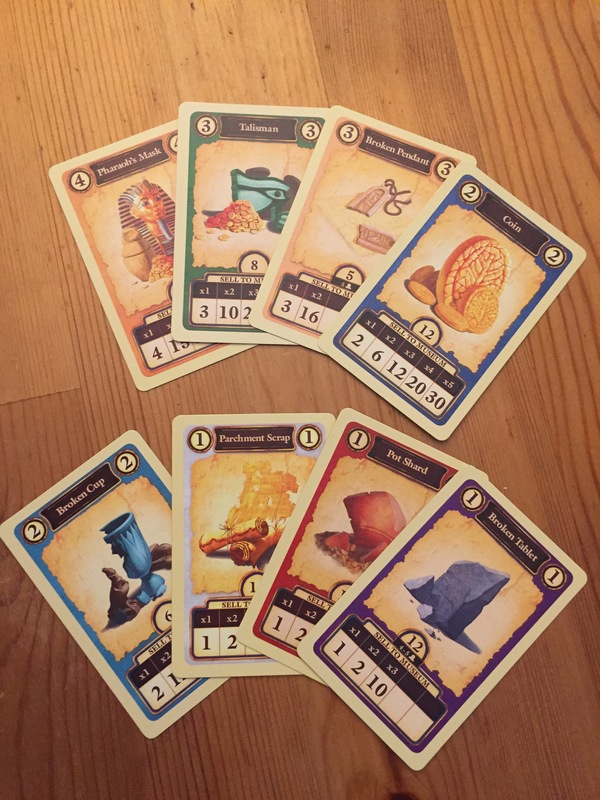 Each player starts the game with four treasure cards and one tent card, and the premise of the game is to end up with the highest total value of treasures sold to a museum. Five additional cards from the deck are placed face-up on the table to make up the starting marketplace. As the game progresses, the player collects treasure cards of the same type and then sells these as sets to the museum for a price value. 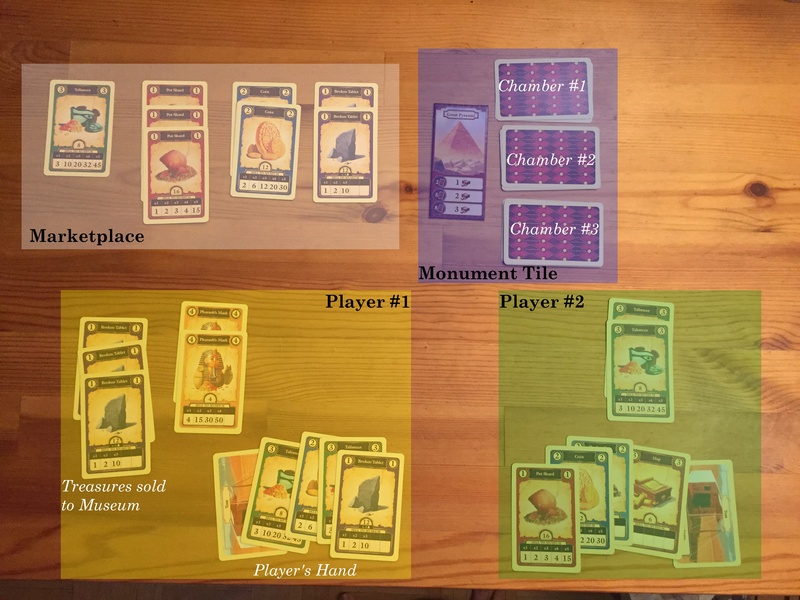 Each turn you “dig” a card from the deck, then decide whether to sell your treasure cards to the museum, exchange cards from your hand with cards available in the marketplace, or pass the turn to the next player (but watch out for thieves and sandstorms!). The game finishes when the final card of the deck is drawn and all players sell the last of their treasure cards to the museum. As an added element to the game, players choose one monument tile from six options, and each tile has a particular outcome on the game mechanics. For beginners, the tile chosen is usually the Great Pyramid. Other options include the Sphinx, Tomb, and Temple. We will talk about these in a moment. There are nine kinds of treasure cards, which range in rarity and value. Potsherds, as is to be expected in archaeology, make up the majority of the cards and are worth $1. But, if you collect five of these in a set, you can sell them to the museum for $15. Similarly, you can collect the Pharaoh’s Mask (each worth $4) and, if you sell a set of four to the museum, you would receive a higher value ($50) as these cards are rarer. In order to exchange cards at the marketplace, the values of the items must be the same for the exchange to take place. For example, the player can trade in one Pharaoh’s Mask (worth $4) and in return pick up three Potsherds ($3) and one Parchment Scrap ($1). There are also six Maps in the deck and you use these cards to interact with the monument tiles. For example, when playing with the Great Pyramid tile you use these maps to open one of its three chambers that contain treasure cards. If a player draws a sandstorm card from the deck, each player loses half their cards to the sandstorm. The player decides which treasure cards they want to give up and these in turn are placed in the marketplace. Every player starts with a tent card at the beginning of the game. If a sandstorm card is drawn, any player can choose to use their tent card in order to avoid being hit by the storm and losing their cards. There are also several thieves hiding in the deck. When a player draws a thief card from the deck, they can steal any card from another player’s hand. The theme of the game reflects the treasure hunting days of early Egyptology. The illustrations are very charming and bring alive the sandstorms and hurdles archaeologists face in the field. Surely, the game creators must have been inspired by the “archaeology” of the early 20th century especially with the predominance of a Tut theme. We recommend this game to be played with at least four players. While the game can at times seem to plod along, the gameplay can be changed depending on which of the six monument tiles are chosen, and the randomness of the sandstorm can keep you in suspense. We found it quite easy to collect potsherds for easy sell-offs to the museum, but much more challenging to complete the Broken Pendant, of which there are only five cards in total, and can only be sold in pairs. Play involves some secrecy, misdirection, and backstabbing, so prepare for some heartbreak as your friends betray you for money. Disclaimer: We also felt it important to mention the unfortunate context of the game as it made us cringe a little bit in the beginning. We said that the game was set in the early days of Egyptology, which was the time of glorified treasure hunting. To our modern eyes, this “treasure hunting” is more akin to looting. Perhaps a more appropriate title for the game instead of Archaeology would be Hunting for Pharaoh’s Treasure, as otherwise it gives the impression that these are archaeological practices still in use today. Unfortunately the game seems to be out of print now, hence the outrageous price tags on Amazon and other websites. But keep an eye out for it and grab some of your fellow treasure-hunters for an Egypt-themed game night. Can you recommend another Egyptomanian game for us to review in a future blog? What do you like to play?